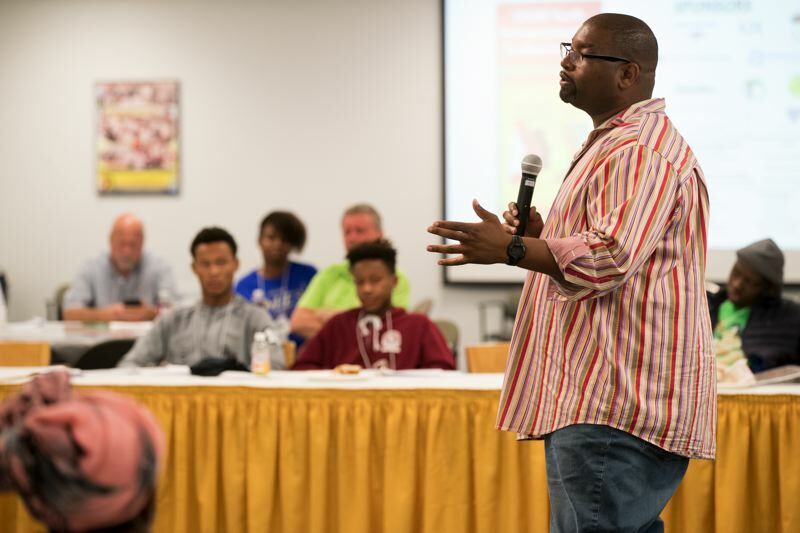 At the annual OAME Youth Entrepreneurship Conference, young adults learn what it takes to launch a successful startup business. Most entrepreneurs have months — or even years — to fine tune their start-up business ventures before pitching to investors. On a recent August day, Isatou Barry had just eight hours. In the space of an average workday, Barry and her teammates participating in the Youth Entrepreneurship Conference hosted by the Oregon Association of Minority Entrepreneurs (OAME) had to come up with an idea for a startup business, dream up a logo and mission statement, brainstorm a business plan, and research and polish a pitch. They weren't alone in their efforts. 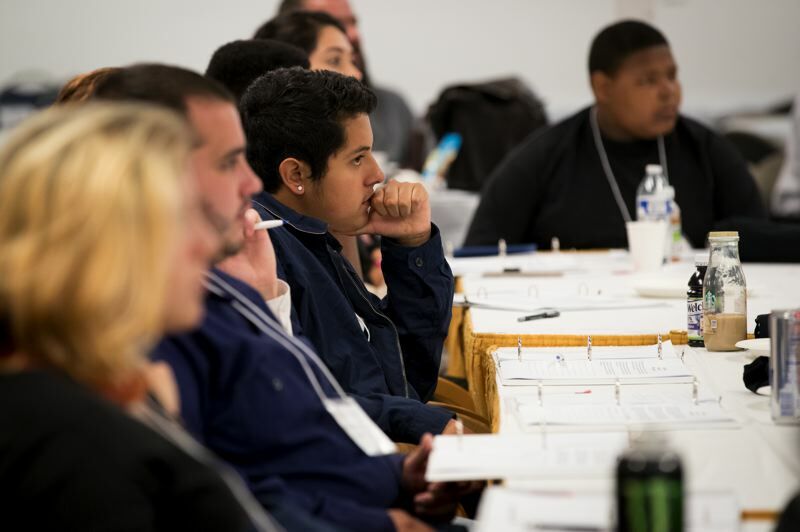 They were part of a group of nearly 30 Oregon high school and college students who came to the conference looking to gain guidance and receive advice from entrepreneurs with proven track records for having started their own successful businesses. For Barry and the other students, creating a solid business plan or presenting a perfect pitch was about more than bragging rights at the end of the day. The conference culminated in a session where the student teams presented the results of their efforts to a panel of judges with an eye toward capturing cash prizes ranging from $120 for third place to $500 for first place. While the money was an incentive, the event — held at the OAME Delta Park Business Center in Portland's Hayden Island area — offered an even greater opportunity for some of the students by opening a door to a world they had never considered entering before. For others, like Barry, who's already set her sights on earning a bachelor's degree in finance and economics and is interested in eventually becoming a lawyer working in microfinancing for women entrepreneurs, being involved in the conference reinforced that she's chosen the right career path for herself. "I'm happy I came," she said. "I learned a lot in just one day." 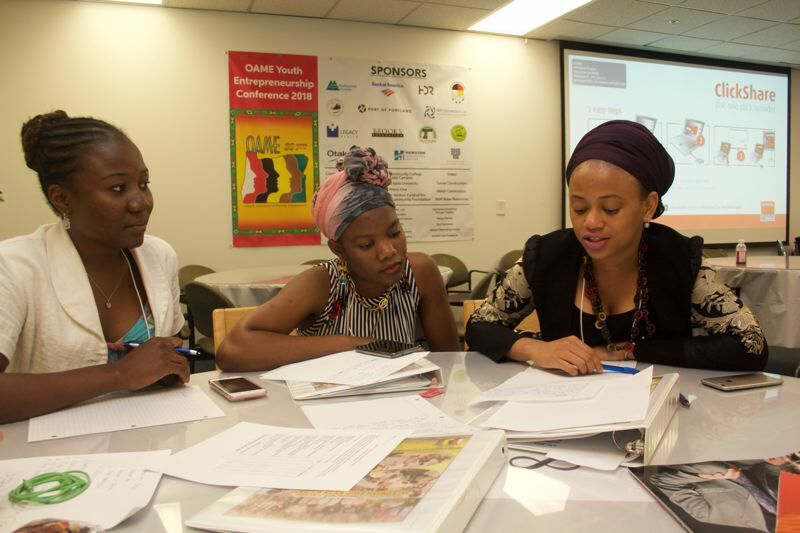 While OAME's main focus is working with adult ethnic minority entrepreneurs, helping young people be successful, especially youth of color, has been a focus of the organization since Sam Brooks founded it in 1987. However, the way that goal has been accomplished has changed over the years. For a time, kids in OAME's youth entrepreneurship program ran a store outfitted with donated excess items from Nike. "The kids learned to go through the process," Brooks said. "They rated items, put the (inventory) on the computer, and sold them. They learned a lot from that." But the venture also required time and effort that made it difficult to maintain with students whose schedules didn't always allow them to work regular hours. So OAME leaders searched for a new plan. For a time, Brooks and his team at OAME considered a food cart business, but again, student schedules made that effort difficult. Finally, the OAME group came up with an idea to hold an event that allowed students to spend a day learning how to put a plan together for a business that they could turn into a reality if they desired. Working with OAME members who had successfully started their own business ventures, students participating in the annual program would spend a busy day creating and compiling the necessary parts of a successful business. At the end of the day, the students would present their work to a team of judges, also entrepreneurs with successful startups to their credit, who would select the three best overall presentations. "The students really walk away with something, and they're ready to go do something," Brooks said. "When they leave, they're pretty pumped." The students aren't the only ones who find themselves energized despite a full day with little down time. The business owners and professionals who volunteer to work with the students say they find themselves inspired and awed by the students. 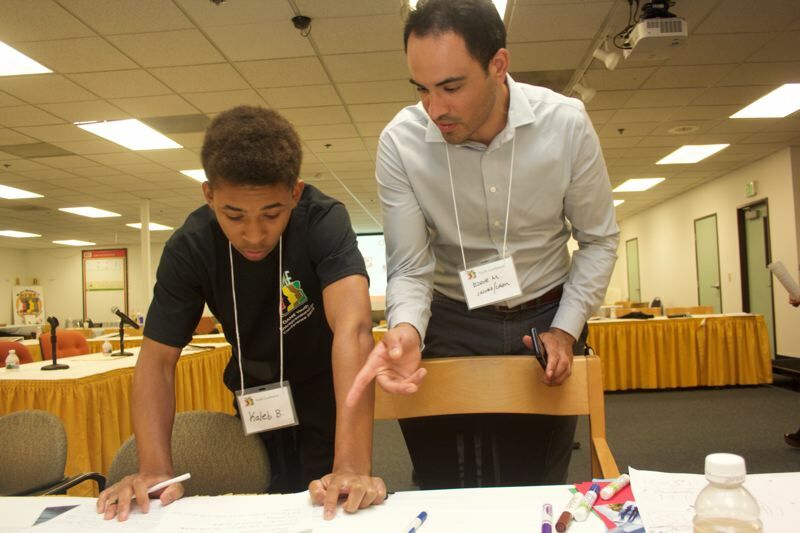 Eddie Montejo with Jacobs Engineering was back as a group mentor for the second consecutive year. He'd enjoyed the experience so much last year that he'd spent all of this year looking forward to meeting a new group of students. While he knew from his past experience that the kids who attend the business conference are impressive, the group this year exceeded his expectations. "When I was their age, all I was thinking about was skateboarding and hanging out with my friends," Montejo said. "They're using their time to learn about business." They also used their time during the conference to organize their startups in a way that would support an aspect that younger generations embrace as a part of their DNA — finding a way to give back to the community, the environment and those who may be in need of a helping hand. Montejo's group of students, for example, made social philanthropy a key component of the team's business, an online venture that would allow customers to design their own hoodies. Based on the group's calculations, for every $1,400 they cleared in pure profit, they would raise another $832 that would benefit a nonprofit of each customer's choosing. For Brooks, that social impact component is just more proof of his belief that while the young entrepreneurs of tomorrow are coming armed with the same passion and drive as their predecessors, they're also bringing more to the table. A lifetime spent with smart devices such as phones and tablets have placed a world of information at their fingertips. A working knowledge of social media means they already have more than a basic understanding of how to leverage ad features on Facebook and Twitter to build brands, gain followers and attract customers. For people who say young people aren't ready, I say (they're) ready." Brooks said. Before Brooks started OAME, he was an entrepreneur with an idea for a staffing company. But as an African-American man knocking on doors in Portland trying to promote his business and drum up those first few clients, he often found the market was less than welcoming. Minority and women entrepreneurs still often face uphill battle when it comes to getting their start-up ventures off the ground, says Nitin Rai, managing director of Portland-based Elevate Capital. One of the biggest challenges is obtaining money to get started. Elevate Capital, which focuses on providing start-up money for diverse entrepreneur-driven Oregon businesses, and OAME, which has a flourishing microloan program, are working to change that situation. But for now, minority and women entrepreneurs are still less likely to receive funding from traditional sources such as banks and general venture capital outlets, Rai said. That fact didn't seem to sway the students who attended the conference, many of whom are already used to having to work harder than their colleagues to pursue their dreams. One group of students from the Job Corps program in Yachats, for example, got up in the wee hours of the morning in order to arrive in Portland for the 7 a.m. start of the conference. As it turned out, the early bird who was the first to arrive for the conference got more than the worm. The first student through the door also received a crisp $100 bill from Brooks. The second arrival won $50, while the third was handed a $20 bill. It's how Brooks shows the students attending the conference that developing the skills necessary to thrive in the working world — from punctuality to listening closely to what others are saying — pays off, literally. Brooks starts each conference session, for example, by encouraging students to write down five things he says every entrepreneur needs to be successful in business. The students also receive numbered tickets. At the end of the day, three tickets are drawn. Brooks then asks the student whose ticket matches the first number drawn a question about the one of the five skills needed for business that he talked about during the morning session. The prize for answering correctly is $100. The students whose numbers are drawn second and third receive $50 and $25, respectively, if they can answer Brooks' questions correctly. "It keeps the kids pumped up," Brooks said. "We have people who attended in past years who are now professionals and they still talk about it." The conference doesn't just energize the academy participants. Students who attend the conference sometimes bring their parents along. "Some of the parents come in and watch, and then next year, they'll volunteer or make a small donation," Brooks said. The students themselves often provide the best word-of-mouth promotion to drum up attendees and support. One family's daughter attended the conference a few years ago, but her brother decided to stay home. The girl ended up winning money for being part of a group with a winning business idea. She also walked out with the $100 bill for being the first to arrive, Brooks said. "Her father said when his son found out how much money she had won, he was angry he didn't attend," Brooks said. "(The son) decided to show up the next year."